During its outbursts, the infant star V1647 Orionis illuminated McNeil's Nebula. In this artistic rendering, magnetic fields drive powerful flows onto the star, creating two hot spots that produce the high-energy emission. Using the X-ray eyes of three space telescopes, astronomers have captured a behind-the-scenes look at the dramatic behavior of a newborn sun-like star, as it spins rapidly and churns out powerful and long-lasting eruptions. The infant star, called V1647 Orionis, is known as a protostar, and was formed by clouds of surrounding gas and dust. The star is located 1,300 light-years away in McNeil's Nebula, which is a bustling hotspot of star formation in the constellation of Orion. V1647 rotates once each day, which is around 30 times faster than the sun, and has two active X-ray emitting spots, where gas flows from a surrounding disk and feeds the growing star. The young star has intrigued astronomers since it erupted in 2004 and lit up McNeil's Nebula for two years, dying down in early 2006, the researchers said. The stellar newborn acted up again in 2008, and has remained bright ever since. In a new study, astronomers studied the source of the high-energy emissions using three separate X-ray space telescopes: NASA's Chandra X-ray Observatory, the Japanese Suzaku satellite, and the European Space Agency's XMM-Newton. The researchers began studying V1647 Orionis shortly after it erupted in 2004, and monitored it through 2010, capturing data from both outbursts. "The observations give us a look inside the cradle at a very young star," study co-author Joel Kastner, a professor at Rochester Institute of Technology in Henrietta, N.Y., said in a statement. "It's as though we're able to see its beating heart. We're actually able to watch it rotate. We caught the star at a point where it is rotating so fast as it gains material that it's barely able to hold itself together. It's rotating at near break-up speed." 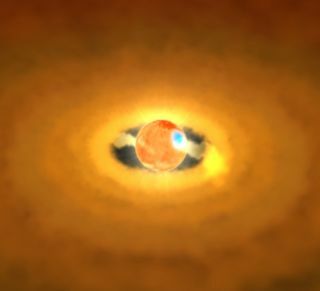 The researchers used the star's X-ray light curves to determine its spin, which makes V1647 one of the youngest stars whose spin has been determined using an X-ray based technique, they said. The scientists were also able to identify the object as a protostar that is still in the process of forming. "Based on infrared studies, we suspect that this protostar is no more than a million years old, and probably much younger," study lead author Kenji Hamaguchi, an astrophysicist at NASA’s Goddard Space Flight Center in Greenbelt, Md., said in a statement. Hamaguchi and his colleagues also studied two regions of V1647 that are emitting X-rays and are thousands of times hotter than the rest of the star. The two dynamic spots are located on opposite sides of the star, with the southerly one five times brighter than the other, the researchers said. The newborn star's low density puffs it up to almost five times the size of the sun, making each of these hotspots sprawling birthmarks, measuring roughly the width of the sun. During the star's extended eruptions, the researchers noted that V1647 gathers mass, spews plasma and X-rays, and exhibits a staggering increase in temperature. "We think that magnetic activity on or around the stellar surface creates the super-hot plasma," Hamaguchi said. "This behavior could be sustained by the continual twisting, breaking, and reconnection of magnetic fields, which connect the star and the disk, but which rotate at different speeds. Magnetic activity on the stellar surface could also be caused by accretion of material onto it." The X-ray emissions observed as the star rotates indicate that for its size, V1647 is spinning as fast as it can without shredding itself to pieces, the scientists said. But despite the violent behavior witnessed from V1647 and the surrounding disk, the star appears to have been relatively stable since the researchers began studying it in 2004. The research combining observations from multiple X-ray satellites is expected to give astronomers better insight into what may be happening inside the dust-cloaked disks of young stars. The detailed results of the study are published in the July 20 edition of the Astrophysical Journal.